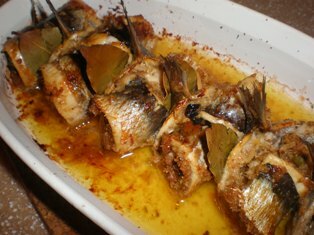 This is a traditional Sicilian dish using fresh sardines that are stuffed, rolled and baked. Prepared in this manner, the sardines are said to resemble the beccafico, a tiny bird that becomes fat from gorging on figs. During assembly, the tail of the fish is twisted upward in imitation of the bird's tail. 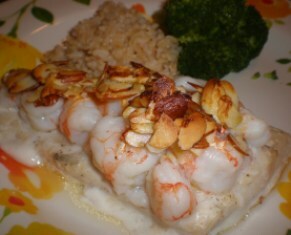 As always, there are a number of variations on this dish. Some cooks add diced caciocavallo cheese to the stuffing and the stuffed sardines are dipped in flour and fried instead of baked. Others soak the currants or raisins in Marsala wine or add saffron to the filling. Because you need to buy fresh whole sardines and clean them before adding the filling, this dish does take a bit of time to prepare. The sardines can be eaten as an appetizer, a main course, or as an addition to an antipasto platter. Cut off the head and fins; remove any scales. Split the fish open along the belly and remove the viscera. Run your finger inside the fish the length of the backbone. The fish should open flat like a book. Lift up and remove the backbone, cutting it off at the tail. Repeat with the remaining sardines. Rinse the fish well, pat dry, and set aside. Add the currants to 1/3 cup of hot water and allow to sit for 10 minutes. Drain the currants and set them aside. Heat 3 tablespoons of oil in a small saucepan over medium-high heat. Add the breadcrumbs. Cook, stirring constantly, until moistened, about 2 minutes. Add the garlic and cook for another minute; remove from heat. Add the currants, pine nuts, capers, parsley, and cheese. Mix well; season with salt and pepper. Select a baking dish large enough to fit all the sardines once they are rolled. Preheat oven to 375 degrees F. In a small bowl, whisk together 4 tablespoons of oil, lemon and orange juice. Pour the mixture over the sardines. Bake until the fish are firm, about 15 minutes. Serve hot, warm, or at room temperature. The essence of Sicilian cooking is its simplicity. Whether you want to make a vitalizing weekend breakfast, a quick after-work supper, or host a relaxing dinner party, these easy, robustly flavored dishes are sure to provide inspiration and win compliments from family and friends.